The opening page of this illustrated book begins ‘This is Stripes. Stripes is Charlie’s favourite knitted cat.’ It then goes on to tell that he is all alone, at preschool, because Charlie has forgotten him. Rather than fret, however, Stripes heads straight to ‘home corner’ where he has lots of fun, cooking up a make-believe party. 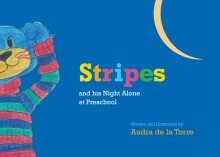 The simplicity of telling readers what Stripes is doing, and then following that with illustrations to match what each piece of text has stated, may well appeal to the very young. The illustrations, some with bold colours and others black outlines on white, show readers a variety of expressions. First he seems shocked when left alone. Then he is happy and smiling while he amuses himself. Missing Charlie, Stripes goes on to draw a picture of himself and his owner playing at the park together. This makes him feel better and he snuggles into the ‘rest sheets’ for a nap. Before he can doze off he hears a sound. It’s Charlie who has come to collect him, calling him a ‘silly cat’ before taking him home. Children who worry about leaving things or have left things behind will easily relate to this element of the story, as might those who themselves fear being left behind. The ending makes room for discussion about how anything that is left behind is always found and the lighthearted delivery of such a potentially frightening situation will ensure young readers are left comforted.